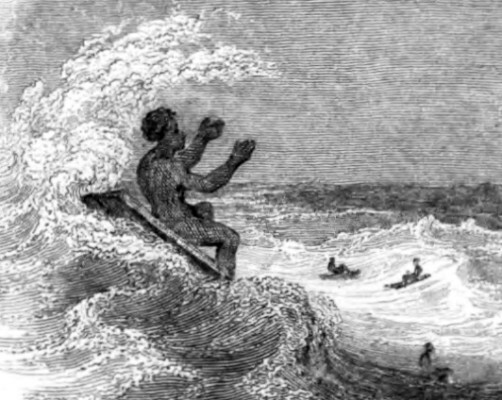 Issac Taylor : Surf Riding in Hawai'i, 1830. Second edition 1831,Third edition 1833. The Ship: A Description of Different Kinds of Vessels. The Ship; or Sketches of the Vessels of Various Countries with the Manner of Building and Navigating Them. Philadelphia, Lippincott, Grambo &Co., 1854. Rev. 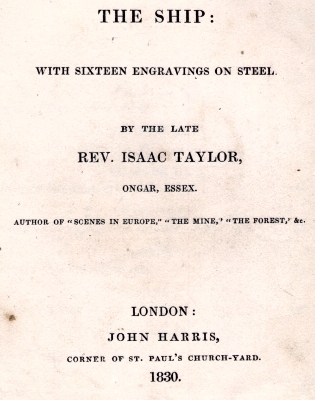 Issac Taylor (1759-1829) was an engraver and a proflic author writer of books for the young, particularly his Christian tracts and the Little Tarry-at-Home Travellers and the Scenes of series. The Ship was one of The Little Library series, written for juvenlie readers, comprising "eighteen small volumes uniformly printed, a familiar Introduction to various branches of useful knowledge." In the text, the father, Mr. Nauticus (addressed as "Papa"), has an extended conversation about the origin and history of ships with his young sons; Charles, Richard, and William. The illustration Surf-Swimming (dated August 1830) is highly unusual in that the perspective is from the water, with the curl of the wave in profile and the shoreline in the background, somewhat reminiscent of Hokusai's famous Under the wave off Kanagawa c.1830. Importantly, the board is placed on the wave face, unlike many early illustrations that show the rider on the back of the wave. It precedes, by the slightest of margins, the widely reproduced Sandwich Island Surf-riders, attributed to F. Howard and first published in Rev. 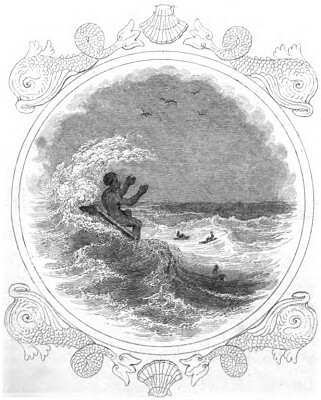 William Ellis' Polynesian Researches in 1831. Page 28 ORIGIN OF SHIPPING. By accident possibly, as, in some case of inundation, which swept all before it, a man might get upon a tree that was floating down, and so escape, landing where the tree stopped. Or by necessity, a traveller, having to cross a river, might cut down a tree, and getting astride of it, might pass over in safety. "In savage nations, we find such to be the beginnings of naval structures. Pubd. Augt. 1830 by J. Harris, St Pauls Church Yard. at the ends, and on it swim out to sea, through a violent surf, plunging under every wave, and rising beyond it; and they come back in the same manner, which is more difficult still. near the shore, they have to steer between the rocks; if they lose their plank and swim home, they fall into disgrace. "The construction of a raft is one of the first and most easy improvements upon the mere plank; this is effected by tying a number of planks or beams together, so as to make a sort of floor, on which goods may be removed, or persons conveyed, across a river. "In modern days, in cases of shipwreck, this is often the only mode of escape." way by which Robinson Crusoe got to land; at least, the way that he took to visit the ship, and bring many of his stores and his cat safe to his island." "What is a canoe, Papa?" said Richard;"is it not a boat?" "A canoe may be called a boat, from its similar use; but it differs widely in its construction. The original canoe is a tree, hollowed out by fire or by the hatchet, and shaped to something like a boat. I wonder your deep reading in Robinson Crusoe, Richard, does not enable you to answer this question yourself." "Oh, so I remember, now! And he could not get it to the water, when he had made it." "Canoes too are not put in motion by oars, as boats are; but are moved by paddles, worked almost perpendicularly. An Indian, in a canoe, sees where he is going; but a sailor, in a boat, goes backwards. "The canoe cut out of a single tree must be heavy and clumsy, being from twelve to forty or fifty feet long. "Some canoes are made up in quite a different manner. They have a sort of skeleton of wooden ribs, which are covered with skins; these are very light, and are carried from place to place, when the navigator meets with a rapid, or a fall of water. These are much in use with the American Indians. The Greenlander's canoe is very much of this nature; it is also covered over the top with a skin, so as to shut the voyager in, as he sits in it: No water can enter, if he be dexterous in keeping himself upright. It will carry only one person; but he can manage it adroitly and effectively even in the roughest seas. "Vessels somewhat like this were observed in Britain by Julius Caesar, and are still used. 37 CANOES OF THE SOCIETY ISLANDS. "The canoes of the Marquesas Islands are about twenty feet long, and less than two feet wide, made out of a single tree. The head and the stern are curiously carved out of a solid piece of timber; sometimes with a sort of resemblance to a human face. 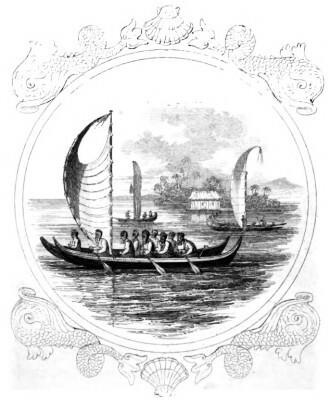 "The canoes of the Society Islands are perhaps among the most laboured and ingenious of their works; especially as here we see an excellent contrivance for safety in the double canoe. in this situation strong beams are laid across, from one to the other, and fastened to each in a firm manner. It is almost impossible that this should overset. Across these poles is laid a platform of boards, making a floor, somewhat raised, that the rowers may work underneath: on this the fighting men stand in their engagements; and thence they hurl huge stones from slings, or throw their barbed spears. These canoes have one mast, with steps upon the platform, which can easily be taken down. "We may admire these canoes, especially considering the mode in which they are built. We refer to times before the missionaries instructed them. They had a clumsy chisel, made of a man's arm bone; and for knives, they used several kinds of shells. The keel and the principal parts of the canoe are formed separately, without any saw or plane. These are placed upon blocks, in their proper position, and supported with props. They are then joined with strong strings, plaited together, which are passed through holes in their slight timbers. These are very neatly covered with planks, about an inch and a half thick, which are cut out of a solid piece, as they have no notion of bending them. Yet some of their war-canoes will carry from thirty to a hundred men; and are even seventy feet long, and six feet wide. These are ornamented with open trellis-work, and covered with fringes of black feathers: some of the boards have tufts of white feathers. eyes made of shells, and an enormously large tongue hanging out of the mouth. "Their double canoes are well constructed to prevent their being overset: but their single canoes have also a contrivance for the same purpose, by sailors called an out-rigger, formed of a couple of poles lying across the canoe, and supporting a sort of platform. This can be moved out, on the side wanted, and, acting as a lever, it prevents the vessel from reeling too much, or being in any danger of capsizing." "Capsizing, Papa! What is that?" Page 41 PROAS OF THE LADRONE ISLES. Richard tried to laugh at this recollection; but he was not half so loud as the others, who had helped to get it out again. "The canoes of the Friendly Isles are said to exceed all others in neatness and good workmanship. They are constructed of several pieces, sewed together so closely, and so firmly, that one can hardly see the joinings. One side of these canoes, that which is on the lee side, or away from the wind, is entirely straight, the other is bowed out, in the usual shape. The ends are by this means made very sharp, to cut the water, especially as they are made narrower hereby. can come back again with ease. Canoes thus formed would be very liable to turn over; indeed, they could hardly live in a rough sea. like a small boat, at its end. The weight of this frame keeps the balance, for the wind can hardly tilt the canoe so as to raise the frame out of the water; while the hollowness of the little boat prevents its sinking on that side. "The planks of this proa are sewed together with stripes of bark: no iron being used in it. The sails consist of mats; and the masts, yards, and outrigger, are made of the bamboo, which is extremely light. "When we speak of a boat, we mean something put together with much greater skill." Detail, left, title and accreditation, below. Geoff Cater (2012) : Issac Taylor : Surf Riding in Hawaii, 1830.